'Blade Runner' Oscar Pistorius In Custody After Girlfriend's Shooting Death : The Two-Way A woman was killed Thursday at the home of he South African Olympic and Paralympic athlete. Police tell South African news outlets that Pistorius is the only suspect. Oscar Pistorius of South Africa leaves the starting blocks of the men's 400-meter race at the 2012 London Olympics. Our most recent update was added at 1:45 p.m. ET. South African Paralympic and Olympic athlete Oscar Pistorius "has been charged with the murder of his girlfriend," The Associated Press reports from Pretoria. Reeva Steenkamp was shot and killed inside Pistorius' home early Thursday, police say. "Police said a 26-year-old male would appear in court later. ... Police in South Africa do not name suspects in crimes until they have appeared in court but police spokesperson Brigadier Denise Beukes said that Pistorius was at his home after the death of Steenkamp and 'there is no other suspect involved.' "
According to the athlete's website, he was born on Nov. 22, 1986 — making him 26. "Pistorius arrived in a police convoy at the Mamelodi Day Hospital on Thursday following the Valentine's Day shooting of model and law graduate Reeva Steenkamp at his home. He was taken to the clinic at high speed following a period at the Boschkop police station in the morning. According to police spokesperson Brigadier Denise Beukes, his blood alcohol levels would be tested, and his fingernails would be tested for forensic evidence." 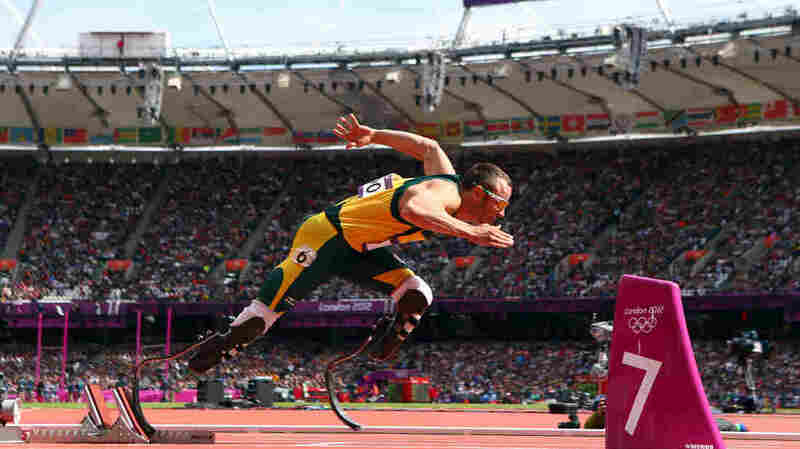 Pistorius made history at the London Olympics. He was the first amputee to ever run in the Games. Pistorius was, as his website says, born "without the fibula, the long, slender bone running along the outside of the leg from below the knee joint and down to the ankle, in each of his legs. His parents, Henk and Sheila, consulted with some of the leading doctors in the world before making the heart-wrenching decision to have his legs amputated below the knee by South African orthopaedic surgeon Dr Gerry Versveld." "He reached the 400m semi-finals in the London 2012 Olympics. At the Paralympics he won silver in the T44 200m, gold in the 4x100 relay and gold in the T44 400m, setting a Paralympic record. For years he dominated in his category at successive Paralympic Games." Pistorius is known as the "blade runner" because of the carbon-fiber prosthetic legs he uses. Pistorius, writes the Los Angeles Times, "will spend the night in jail Thursday after he was charged with murder in the death of his girlfriend at his house, prosecutors said. The National Prosecuting Authority said Pistorius would remain in custody until his hearing Friday, when police intend to oppose bail." "Police say neighbors heard screaming and shouting around the time of the shooting, and that they had been called to investigate incidents of a domestic nature at the same house in the past," the BBC writes. "They also said that they would oppose any bail application." Earlier, the AP was reporting that Pistorius was expected in court later today. now, Reuters and other news outlets are reporting that authorities say the suspect won't appear in court until some time on Friday.